I wanted to share my mantel with you this morning. As I spent weeks figuring out how to decorate the mantel for Christmas, at the same time, I couldn't help think about how I was going to decorate the mantel after Christmas. I finally thought that a winter theme might be nice and something that I hadn't done before. I saw a few pretty yarn & Christmas ball wreaths in blogland, and I loved them. (There's a really beautiful one here.) So, I decided to make one for myself...minus the Christmas balls. 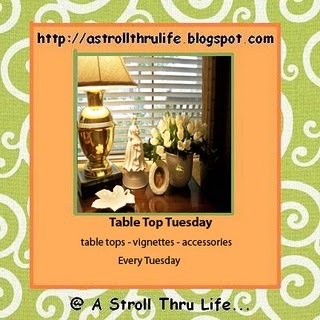 I'm linking this up at Marty's blog A Stroll Thru Life. Every Tuesday, Marty graciously hosts Tabletop Tuesday. Go on over and take a peek. Wishing you a warm & cozy week! I love your winter mantel. I've seen those yarn ball wreaths around too and think they are so pretty. I think yours turned out beautifully. Now I want to make one too. Have a wonderful Monday. That is a really cute mantel! I love the mittens and the blue and white is so pretty. I think your yarn ball wreath is very cute and I can only imagine the 'fun' you had making it. Great job! So pretty!! You're the best decorator!! Gorgeous. I just love the blue and white. I love this, that touch of blue with the white is pretty!